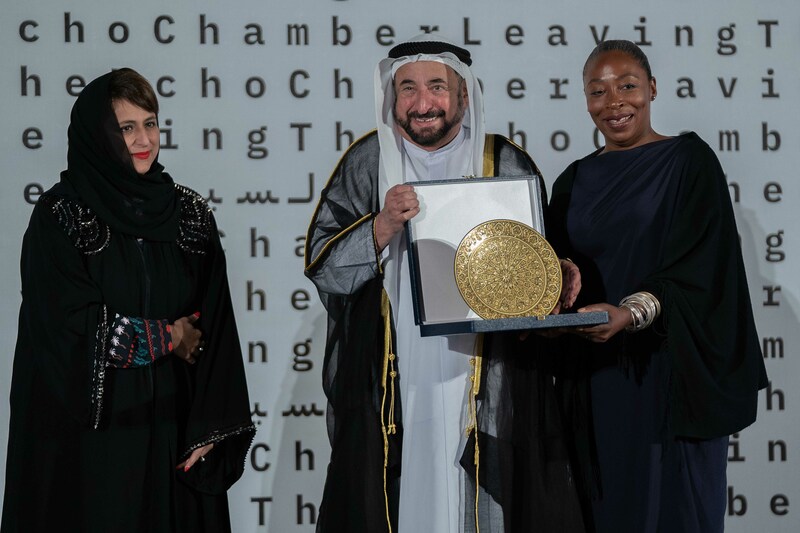 Sharjah, United Arab Emirates – Sharjah Art Foundation announced the winners of the Sharjah Biennial Prize at the opening gala for the Biennial’s 14th edition on the evening of Thursday 7 March 2019. Artists Otobong Nkanga and Emeka Ogboh received the Prize for their collaborative project Aging Ruins Dreaming Only to Recall the Hard Chisel from the Past (2019). Artists Mohamed Bourouissa, Shezad Dawood, Phan Thảo Nguyên and Qiu Zhijie received Special Mentions. A distinguished jury comprised of critic and curator Octavio Zaya, scholar and theorist Homi Bhabha and curator Solange Farkas selected the winners. Sharjah Biennial 14 is made possible through the generous support of Gold Sponsor Van Cleef & Arpels and Silver Sponsor Crescent Petroleum. In-kind support has been provided by Sharjah Municipality, Sharjah Roads and Transport Authority, Sharjah Electricity and Water Authority, Bee’ah and Dubai Economic Department. Established in 2009 to expand programmes beyond the Sharjah Biennial, which launched in 1993, the foundation is a critical resource for artists and cultural organisations in the Gulf and a conduit for local, regional and international developments in contemporary art. The foundation’s deep commitment to developing and sustaining the cultural life and heritage of Sharjah is reflected through year-round exhibitions, performances, screenings and educational programmes in the city of Sharjah and across the Emirate, often hosted in historic buildings that have been repurposed as cultural and community centres. A growing collection reflects the foundation’s support of contemporary artists in the realisation of new work, and its recognition of the contributions made by pioneering modern artists from the region and around the world. Sharjah Art Foundation is a legally independent public body established by Emiri Decree and supported by government funding, grants from national and international nonprofits and cultural organisations, corporate sponsors and individual patrons. All exhibitions and events are free and open to the public. Sharjah is the third-largest of the seven United Arab Emirates, and the only one bridging the Arabian Gulf and the Gulf of Oman. Reflecting the deep commitment to the arts, architectural preservation and cultural education embraced by its ruler, Sheikh Dr Sultan bin Mohammed Al Qasimi, Sharjah is home to more than 20 museums and has long been known as the cultural hub of the United Arab Emirates. In 1998, it was named UNESCO's 'Arab Capital of Culture' and has been designated the UNESCO ‘World Book Capital’ for the year 2019.